A well maintained and professionally polished workplace floor is good business for everyone. Professional Janitorial Services has been working with commercial building owners and managers in Odessa for many years, and have built our reputation around our ability to deliver quality maintenance services at competitive prices. When it comes to stain removal and getting to those hard to reach corners, Professional Janitorial Services gets in there quickly and efficiently. We strive to deliver an exceptionally clean, smooth finish, every time. Let us analyze your traffic patterns, business environment and overall goals to deliver a maintenance schedule that protects your floors and their appearance. Phone us now for a free quote or to discuss how we can save you time and money with our flexible services. Refinish & Restore – Starts with scrubbing existing degraded wax, detailing corners, baseboards and stains, sealant application and a final fresh wax finish. 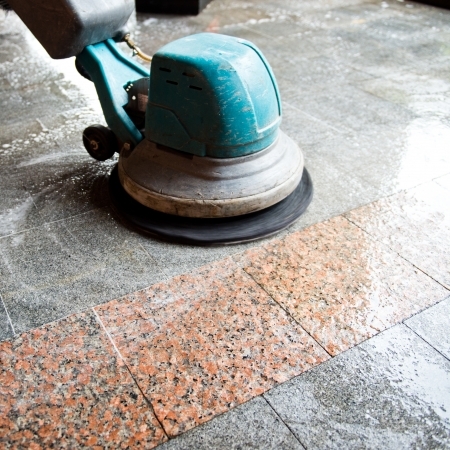 Machine Scrubbing – Ideal for materials like stone, cement, ceramic and porcelain tile scrub and removal of marks and residue, penetrates corners leaving surfaces like new. Burnishing – High-speed scuff removal to maintain ideal shine and high gloss finish. Strip, Wax Application, and Buffing – Recommend at least once a year, stripping away old wax completely, washing and detailing the floor, corners and baseboards. Then we apply fresh wax and buff to a pristine finish. Sealing and Finish – Some surfaces benefit from non-slip top coat applications and stain resistant sealers. Get in touch with us to discuss the products and services we are proud to stand behind and how they can benefit your organization by saving your time and money. Installing a Brand-New Floor in Midland or Odessa? Professional Janitorial Services partners with many contractors and business owners in Midland and Odessa on new floor covering installation projects. We are your most reliable initial floor finishing experts and can help you keep your project on time and on budget. For more information on the benefits of partnering with Professional Janitorial Services connect with us via phone or email. We are happy to offer a free, comprehensive estimate and seasoned custodial floor care advice for commercial clients across Odessa.